Let your self be fascinated by the fantastic life of the bees in a genuinely rural environment on the island of Orust. 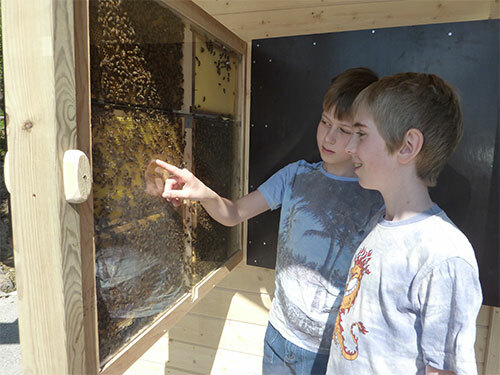 Learn about the bees and their important connection to man and environment, take a look at our bee exhibition, see how live bees live and work behind the glass of the display hive, test your self on the Bee-quiz or go on bee-safari. In Swedish you can also take a guided tour with our beekeeper or take our course -Beekeeper for a day. 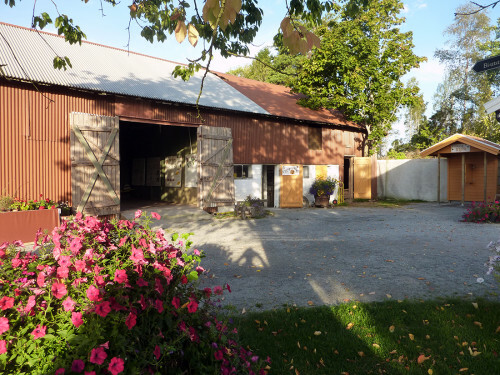 In the old barn we have the exhibition where you can learn about the life of a bee. There is also information material och posters you can read to learn more. If you like you can watch a short dvd about bees and beekeeping. If you would like to look closer at the bees you can visit the display hive. The front of the hive is placed up towards the woods behind a fence so that we humans do not disturb the bees going in and out of the hive. On the back of the hive we have placed doors that you can open and look at the bees working behind the glass. Can you find the Queen? When you have looked for a while you must remember to close the doors again. The bees are happiest in the dark. A day about the work of a beekeeper during the whole year. Perfect for those who is considering to get a hive or two but don’t really know how much work there is or for you who is just curios and like to know more. Suit up in bee overalls and jump in to the bee-safari wagon to go visit the bees! Taste the fresh honey directly from the hive and experience the bees live!